Surface: Dirt & Wooden Flumes. Location: Just over 6 miles from Nevada City on Highway 49 North. The Independence West Trail is recognized as the first Wilderness Trail in the country for all abilities. We were surprised that it took us a year before we realized that we lived less than 50 miles from this historic trail. Once known, we were at the trailhead in less than a week. It was nice to find a disabled parking spot adjacent to the trailhead. Despite being along the highway, we had more than enough room to unload the chair and safely transfer Kellisa. The trail was created from the old Excelsior Ditch high above the Yuba River. The path hugs the hillside high about the South Yuba River as it crosses several restored wooden flumes. Instinct told us to pushike inside the ditch instead of above on the miner’s access trail. This would prove to be the easier and safer route to pushike. A covered viewing platform appears at the .4 mile marker for views across the valley. The real attraction on this trail is Flume 28 located 1 mile from the trailhead. We found the trail to be muddy, but pushable just before reaching the flume which had orange cones screwed to the wood planks blocking passage for those one wheels. We were able to plow through without too much trouble. In the middle of Flume 28, there’s a ramp that utilized switchbacks down to the level of the river. The turnoff was blocked by secured boards preventing the safe decent to the river due to a missing section of the wooden walkway. We were looking forward to cooling off in the river. Our pushike continue past Flume 28 where we found an abandoned accessible camping spot. The area has a dilapidated wooden outhouse and picnic table on a platform with a wheelchair ramp. The entire area appears to have been neglected for many years and is not usable at this time which is unfortunate. We would love the opportunity to have an accessible campsite so easy to reach in such a beautiful setting. We continued on until an angled tree blocked the trail. I could have removed Kellisa from her chair and figured out a way to transport both to the other side, but since it was getting hot, we had already gone 1.57 miles, and this is an out and back trail, I decided it was a good place to turn around. I’m not a huge fan of trails where you have to backtrack any portion of the trail, much less the entire trail. 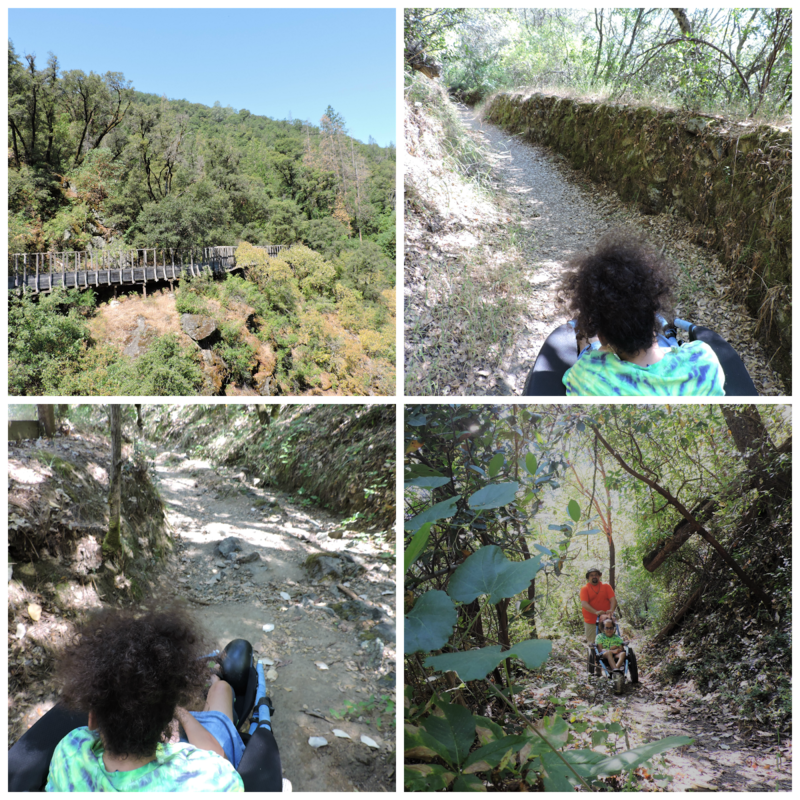 However, the Independence Trail West has me reviewing my dislike because we observed several flowers missed on the out hike and the views from the flumes from a new direction made it seem like we were pushiking a new trail. Even though the trail is rated accessible, it would be very difficult to push someone in a standard wheelchair along this trail. Besides the muddy section, the trail has embedded rocks throughout that can be navigated around with care in all but one short section. A few portions are narrow due to overgrown foliage. 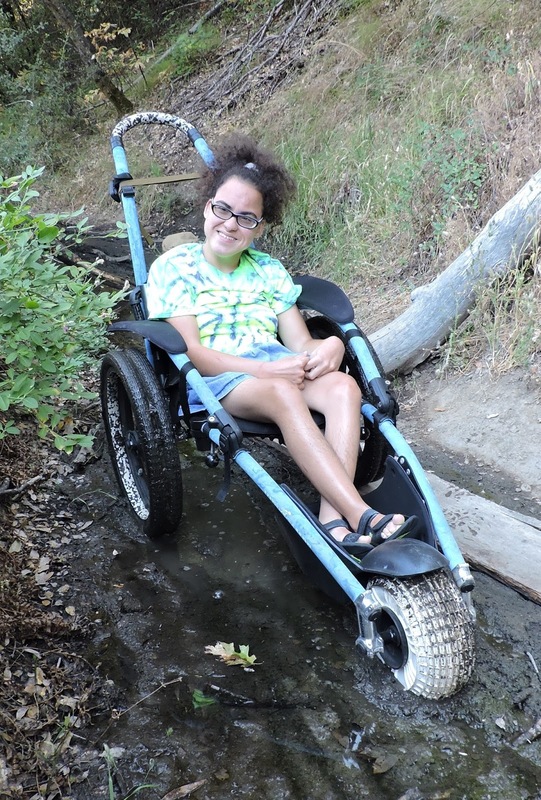 I would strongly recommend staying in the ditch whenever you have the option if you are hiking with anyone on wheels or any kind of limited mobility. The trail above the ditch always ends with a set of stairs with the only alternative being a steep and rocky connecting path. Anyone using a mobility chair designed for trails or standard jog strollers should find this trail easy unless you visit shortly after heavy rains. I would imagine most, if not all of the trail would become a muddy mess following any significant rain. If only I was not stuck at home preparing for final exams I would have loved to enjoy a wild December winter night like yours.